Happy Hump Day everyone! Yes, today is Wednesday, and that means that the week is finally reached the halfway point. Some weeks go faster than others it seems, and around the holidays, it seems like time is just slipping by fast! The weather is getting cold, and for those of you with snow, I bet you are wishing it was summer again. 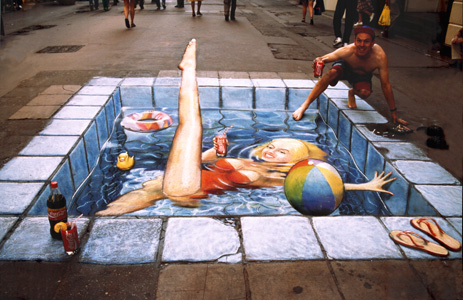 Speaking of summer, today’s optical illusion is all about relaxing in a beautiful pool, but is it a real pool or a very clever drawing created by a talented artist. What do you all think of it? How real does it look? The man who is about to climb into the pool looks like he is having a blast, and who could blame him because look at the lovely woman in the pool too! Ready for another cool optical illusion? Check out the lovely Statue of Liberty that is made of people! How cool is this that so many people were able to come together to create a very realistic looking image of the world’s most famous statue. Well, today is Wednesday, and we know you all are working hard, but hang on because the week is half over now, and soon it’ll be the weekend. Have a good Wednesday.